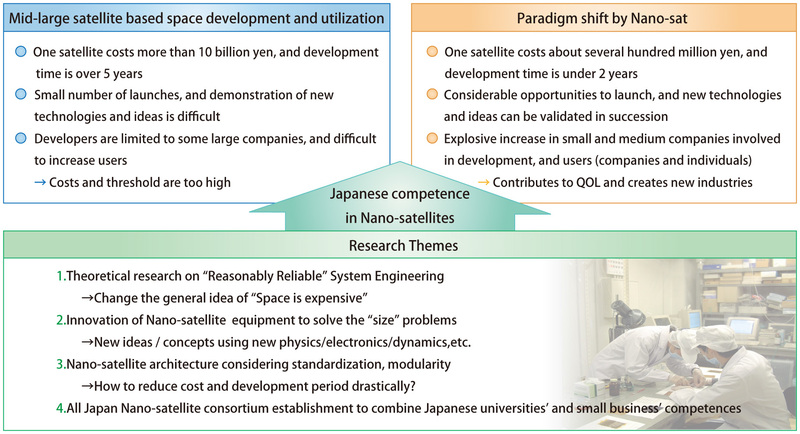 In 2010, we started the Japanese government funded project, "New Paradigm of Space Development and Utilization by Nano-satellite", which focuses on the technological innovation, strategy, and utilization of Nano-satellites. The project was led by Prof. Shinichi Nakasuka (The University of Tokyo) and research and development has continued through the coordinated efforts of many different universities, researchers, and separate enterprises. During this project, we established the All JAPAN organization, which provides a way for universities and companies to participate in the Nano-Satellite Frontier Project and work collaboratively with us. The primary roles of the Nano-Satellite Center in this project are researching potential users of satellites and exploring innovative ways Nano-satellite technology can be applied to industry. NSC aims to make Nano-satellite technology and the Nano-Satellite Frontier project more readily available to people who may not have had any experience with it before.